While researching for assignment four, I came across works by Micah Lexier. These were works I had seen before but now I was looking at them in a whole new light. I knew I wanted to stick with the theme of unconventional portraits for the last assignment and I didn’t even think of using Lexier’s work as inspiration because I had never thought of him as an artist who did portraits. The way Lexier uses text in his work is quite interesting. He is able to create thought provoking portraits through the use of text only. In Now & Then, shown above, he uses text to create a unique self portrait. 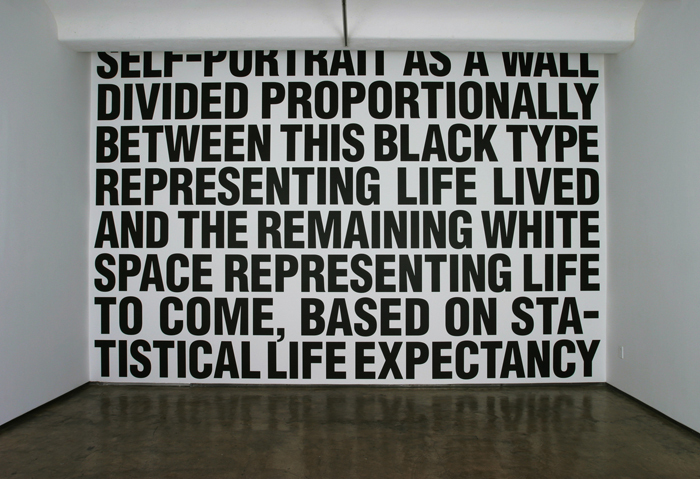 The black text represents the life he has lived so far while the rest of the white space on the wall represents the life he has yet to live according to the average life expectancy. The size of the text and the boldness makes the message pop and confronts the viewer with a visual representation of how much time Lexier has left to live while also forcing them to reflect on their own life. 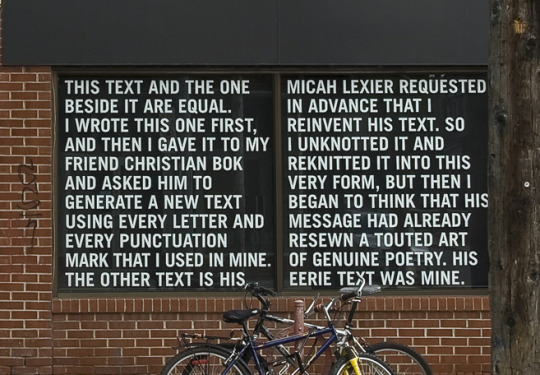 Another text piece by Lexier, Two Equal Texts, is an interesting and unconventional portrait. He wrote a sample of text and asked a friend to create a new piece of text using every letter and punctuation. In this sense, the two text pieces are portraits of one another. The font and boldness is the same as Now & Then in that it is generic enough so that the viewer can focus on the message instead of the aesthetics of the font. 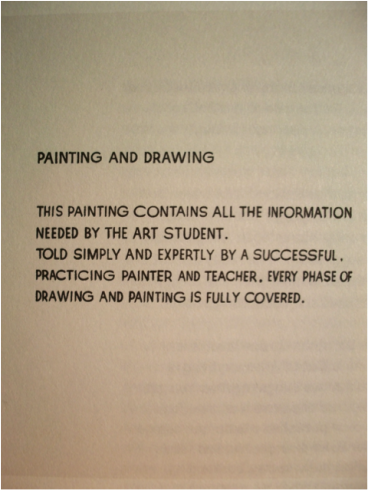 Lexier isn’t the only artist to approach this style of portrait making, John Baldessari also works a lot with text. 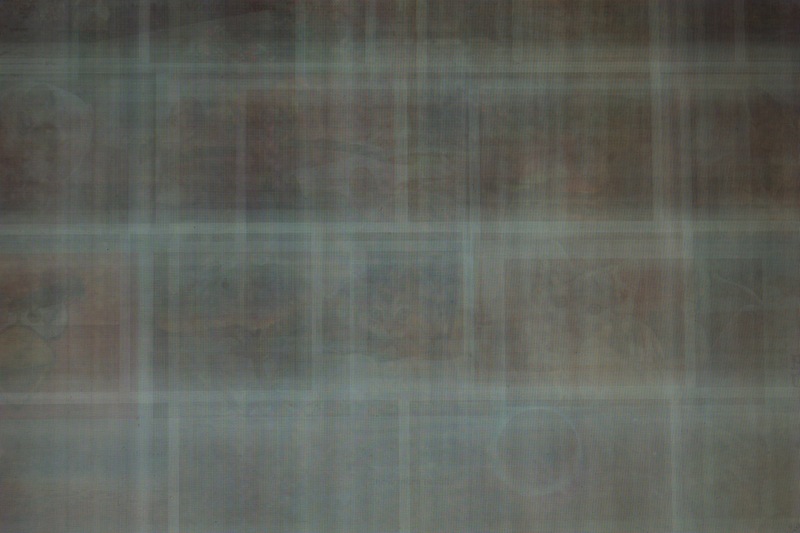 In the piece shown above, Painting and Drawing, he creates a painting with no images, only words. Painting and Drawing is a portrait of any and all painting and drawing. 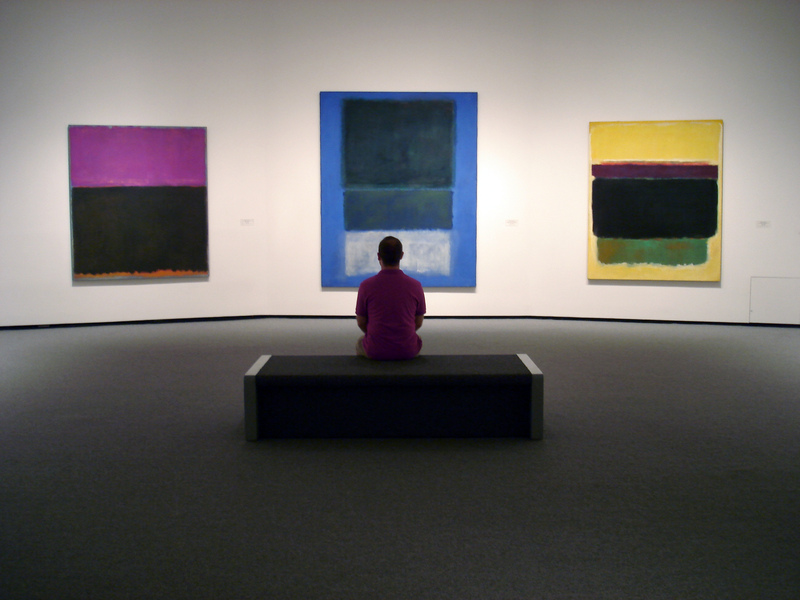 Though it doesn’t contain any images, it makes you recall paintings and drawings that you’ve seen in the past. It also makes you question what a painting or a drawing can be. I think the idea of creating a portrait of something through text is very interesting. This forces the viewer to create an image in their head and provides them with a different viewing experience than a piece with images. 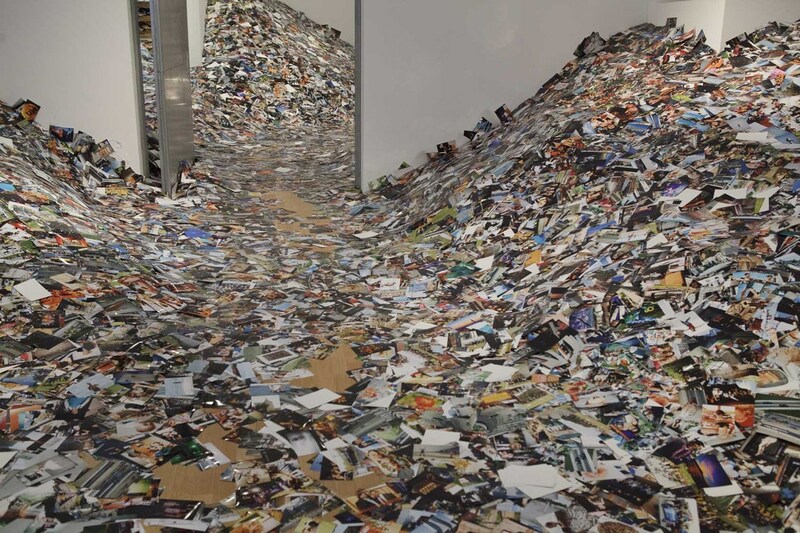 – Installation of 1 million photos uploaded to Flickr, Facebook and Google in 24 hours. 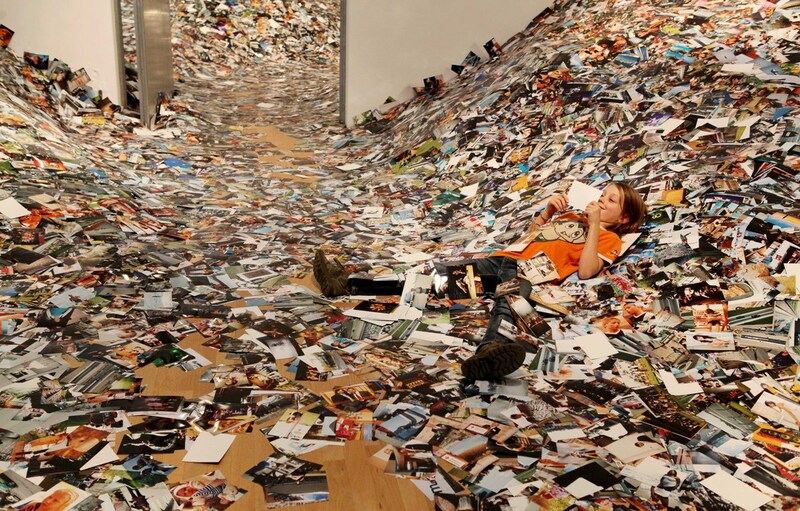 – Shows how we constantly overwhelmed by the amount of images we are presented and have access to. – Shows how public our private life has become. – Uses appropriation and extraction from social media and online shopping sites (flickr, craigslist, ebay). 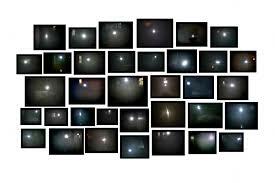 – Uses subjects that are collectively photographed, and then collects them herself. – Has a strong interest on how images function differently online than print-based images. – Aspects of “images-blindness” (as discussed in the third reading). – Every image of a sunset uploaded to Flickr. 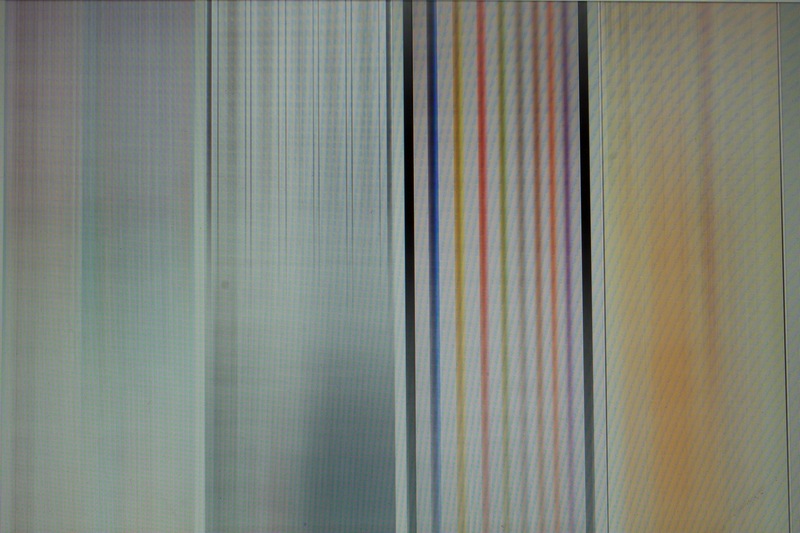 – Images of televisions put up for sale on craigslist. – The people taking the photographs don’t realise how personal these images really are and uploading them online for anyone to see, in the same way that people looking to buy a television are not noticing the reflections. – The overwhelming amount of images we see daily distorts the way we view things just as the overwhelming amount of time we spend on our phones distorts the way we experience things. – To critique not only image-blindness but experience-blindness that technology, cell phones in particular, impart on us. 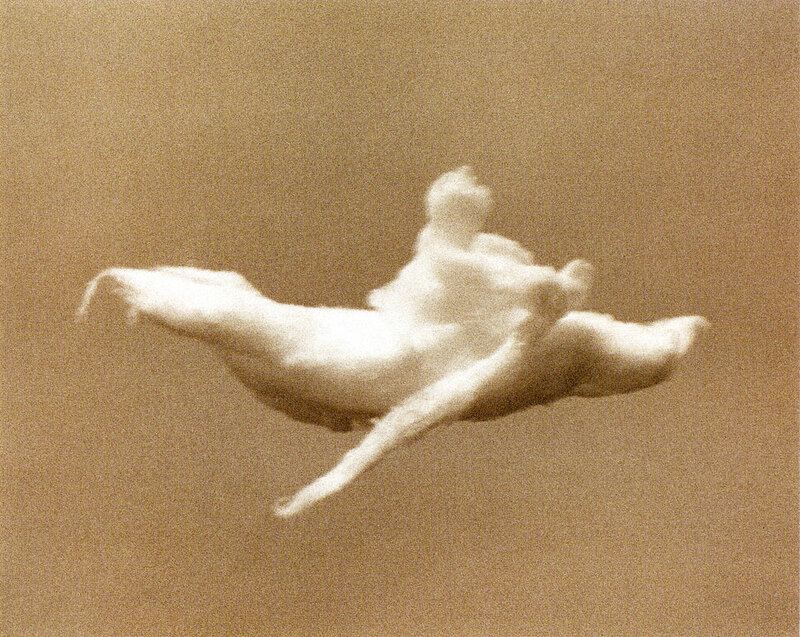 Between 1922-35, Alfred Steglitz created a series of photographs titled ‘Equivalent (series)’ these photographs were taken of the cloud formations which took place in the sky. Steglitz believed that clouds were capable of representing ‘abstract equivalents of his own experiences thoughts and emotions.’  The lines, shapes, formations and colours depicted through the clouds and then later, the photographs, were reflections of the inner soul and through this practice, it upheld the modernist values and in response Steglitz formed the term Equivalents. Gelatin silver print medium. Both Steglitz and Muniz layer meaning within their works while exercising abstraction, while Steglitz comments of the equivalents between form and emotion Muniz is more so referencing the tangibility of cotton and clouds. Muniz continues his thoughts on clouds through his bronze sculptures that imitate Gianlorenzo Bernini’s baroque marble renderings of clouds in the Ecstasy of Saint Teresa. Although the clouds Muniz installed are held up by thick metal rods, the clouds still appear weightless and fluffy. 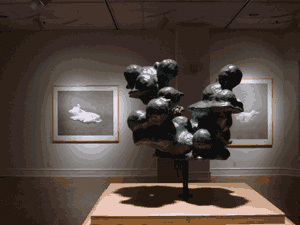 As well as the photographs the sculptures provoke one to use their imagination to create representations in their mind. While the photographs are named, hinting at clues which guide the imagination the sculptures are all untitled to give full reins to the viewer. Muniz asks this question of does it matter if the clouds are real or not if the same kind of thoughts and reactions are provoked? He then goes on to talk about how to access these memories and create an image; it roots back to language, one cannot envision a cloud looking like a certain representation if one does not have that knowledge and the content then goes unnoticed. That’s what I appreciate about his cloud series, that there is something there for everyone who has an imagination of their own or as he says quoting Aristotle ‘the eye of the soul’. It’s interesting because Muniz comments on Aristotle interpretation of abstraction as an immediate experience from a distance. I find this very interesting because he then relates this to miracles, he quotes St. Augustine in saying “Miracles happen, not in opposition to Nature, but in opposition to what we know of Nature.” It is not miraculous that we see representations in clouds, miraculous depends more so on the notion of proof and substance. I think that by creating deception in a work, to imitate the real without it necessarily being that reality, can stop to make people think about what it is they’re really looking at and what that means in opposition to looking at the true experience, inventing that distance, guiding that abstraction, I believe can act as cycle that leads us back to the miraculous. His series ‘Pictures of Holes’ photographs of holes in forms of other things. There’s countless other projects that carry out this notion of the imagination and the medium of one in matrix with another. Another Artist I was looking at is a graffiti and Fine Artist who goes by the name of Saber. Unlike Muniz who’s clouds were inspired by sky culture Saber uses the sky as a canvas for his medium. He used five flying planes to carry messages about a presidential candidate who plans to kill funding for artists. Saber recognized the benefits of spreading messages across an area that reaches so many people because the sky is apart of our day, everyday. Saber believes that cutting funds in the arts is like cutting jobs that make up the engine of our economy especially an economy that grows through creative thinking. 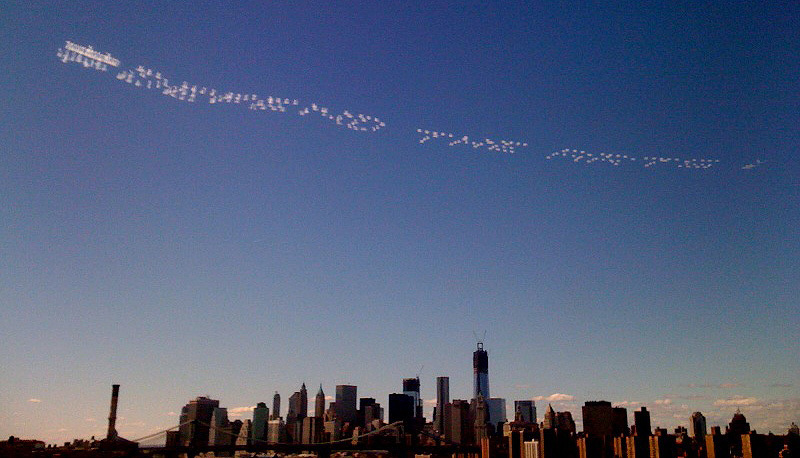 Messages like “Defend the Arts” and “Protect” flew around the NY sky for an hour and half and had an estimated 20 mile radius for those to see. Saber included a # before every message, I believe this was done because like social media and communication through the internet Saber found a way to reach many people very quickly. Using the sky as a canvas his message was literally carried through an everyday aspect of being human, the sky. 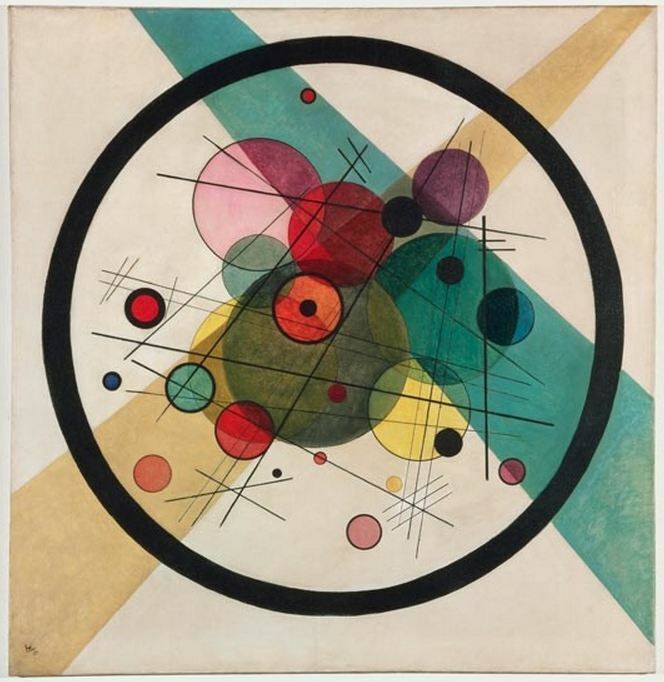 Saber also does a lot of paintings which express graffiti on the canvas creating a ‘new reality’ and also works with digital mediums to create and activate political debates. What is my series considering? The nature of this project is colour, how they interact, how they can stand out from the crowd. It is fundamental to the act of seeing. It is hard to separate colour from the sight. 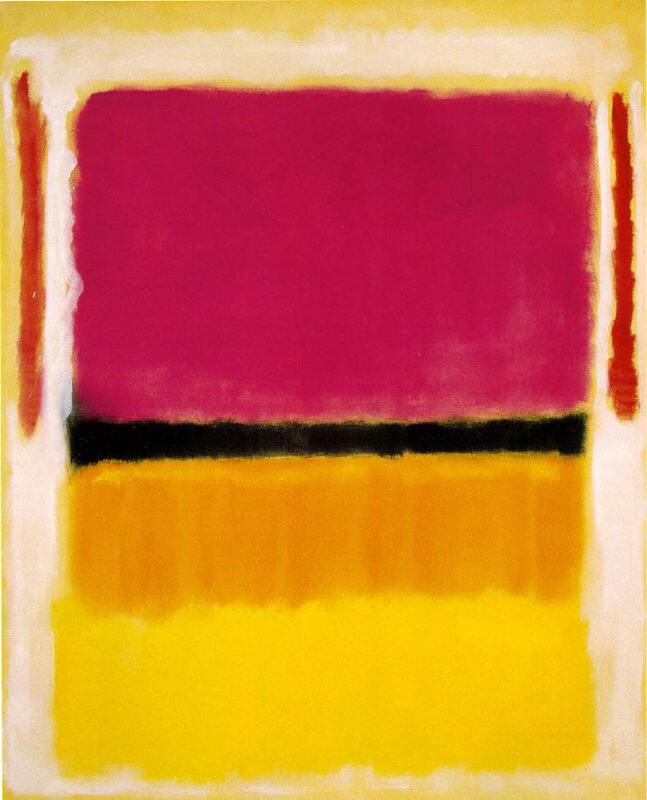 Colour alone, without context (in an abstract form) can create a story, a feeling, a person. While not artists but theorist, these two individuals have a significant impact on my piece. 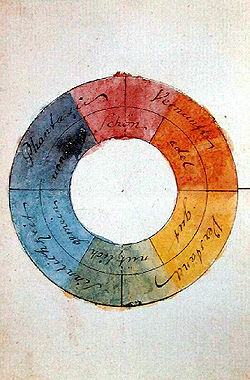 The colours, and medium give the feel of true pigments, and reference to the colour wheels of past. 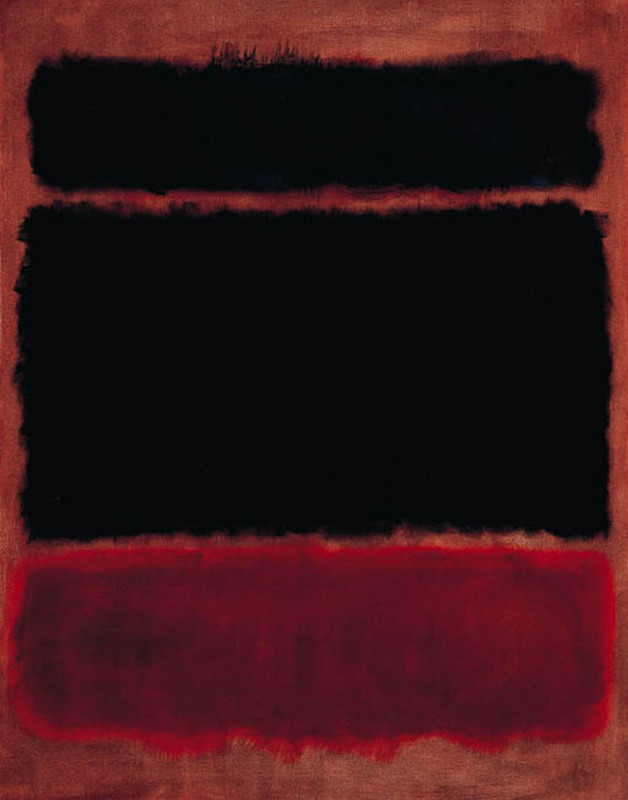 The “first” abstract painter was inspired by an old painting of his turned on its side. 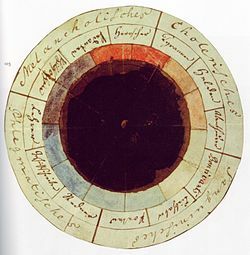 The removal of referential objects allowed the full impact of pure colour to work on his senses. 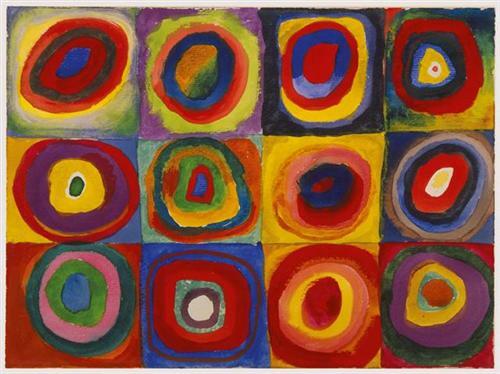 He believed that objects were only obstructing his direct communion with colour. 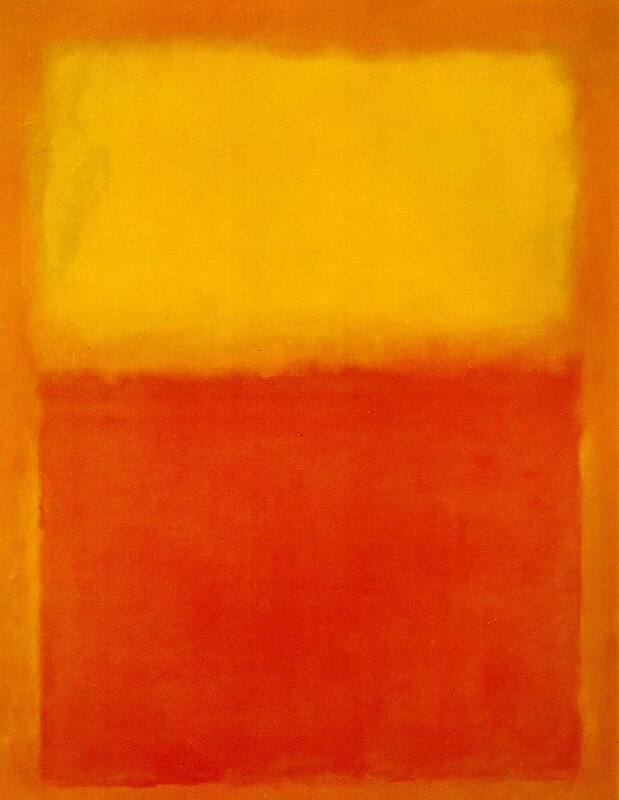 Rothko had a notion that viewers of his work should cry from the emotions they felt from viewing it. 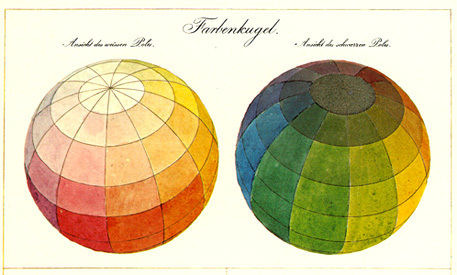 He had an amazing understanding of colour, how one colour could enforce another, and how all colours can cause emotions. 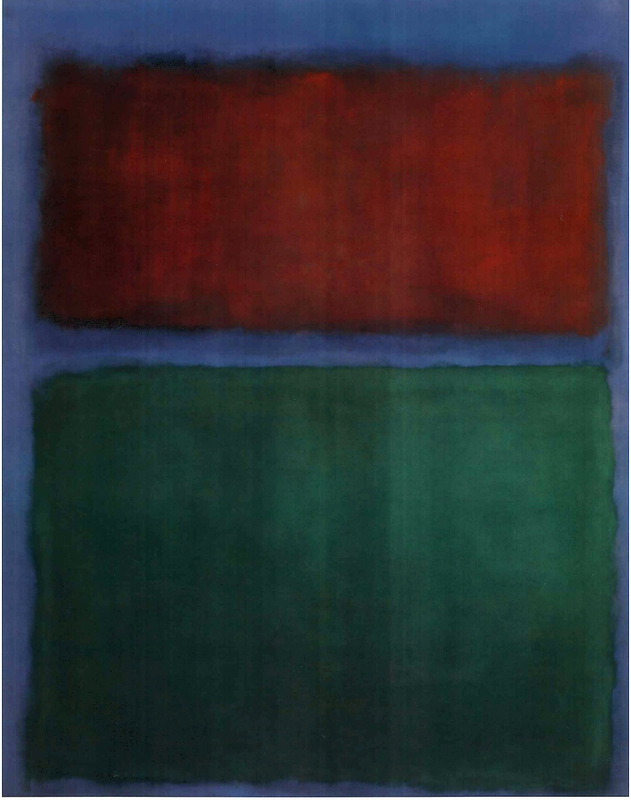 His paintings are abstract and rely on colour, however, Rothko expressed that the paintings were of something. 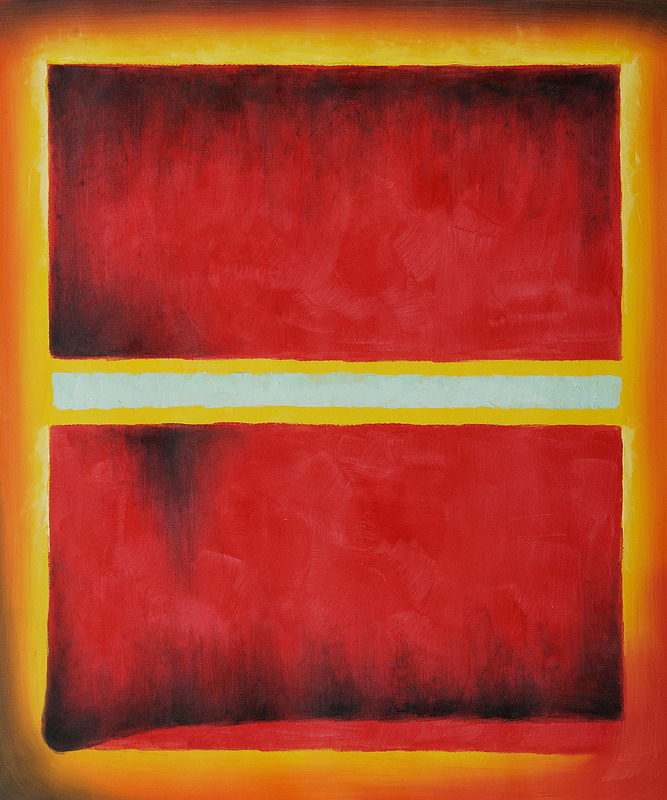 The colours were simply his way of depicting the emotions and feelings of the moment or thing he felt called to paint. During my exploration of a fall portrait. Particular colours which seems out of place grabbed my attention, realizing that we often view things, but we don’t really see them. This process lead me to think of the banal moments in our every day life. We live these moments, such as making your bed in the morning, or waiting on the bus, that we view in complete boredom. However, imagine if you were to really look, and saw the beauty in each image, each moment. Colours shape our world, but I worry that we see it in black and white. 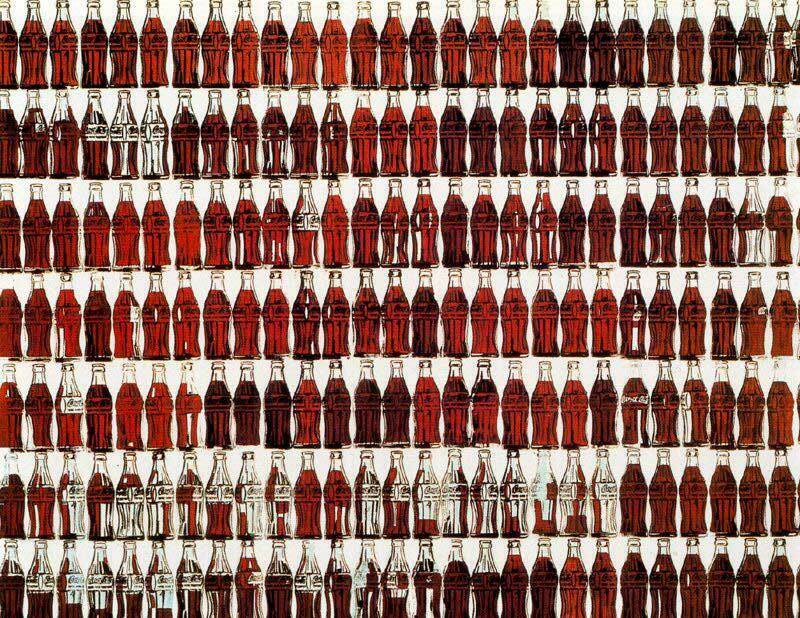 Like with many pop artist, I am concerned with mass consumption of our era. 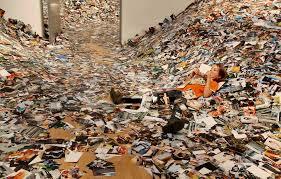 However, my concern is for the consumption of images and moments as opposed to items. We take for granted the moments we live and the images we see, ignoring the striking beauty of each. This concept goes hand in hand with the beauty in the banal. I hope that in my exploration, I am able to bring a new appreciation to every moment. 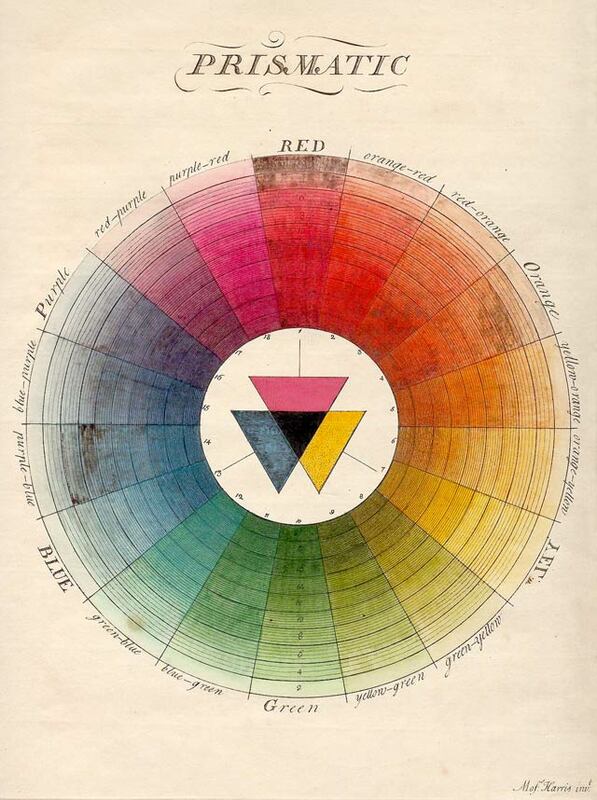 I believe there to be a link between how we consume images, and how we consume colour. 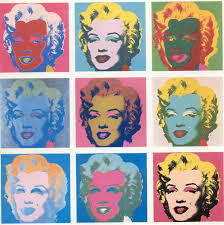 Unlike Warhol who uses repetition to mimic the process of our mass consumption, I hope to do the opposite. 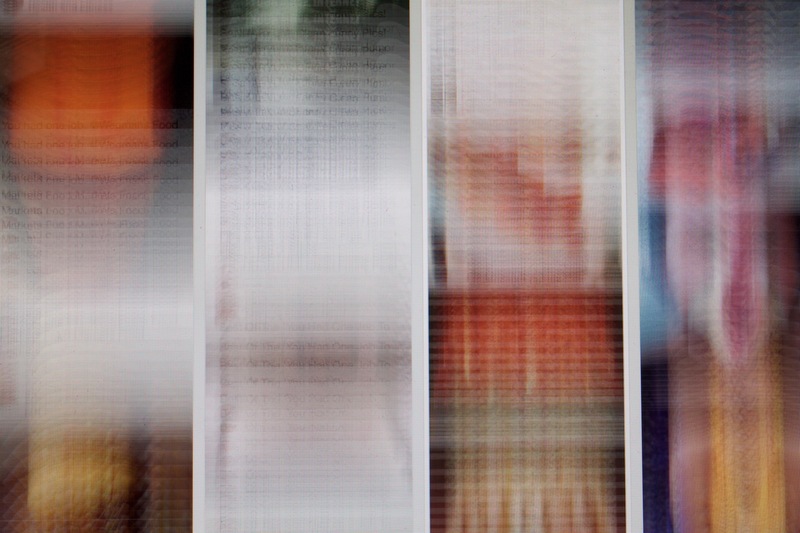 Through my repetition, I hope my images causes the viewer to slow down and absorb the image. Creating a moment where a viewer may be able to experience the opposite of the mass consumption of images they view every day. 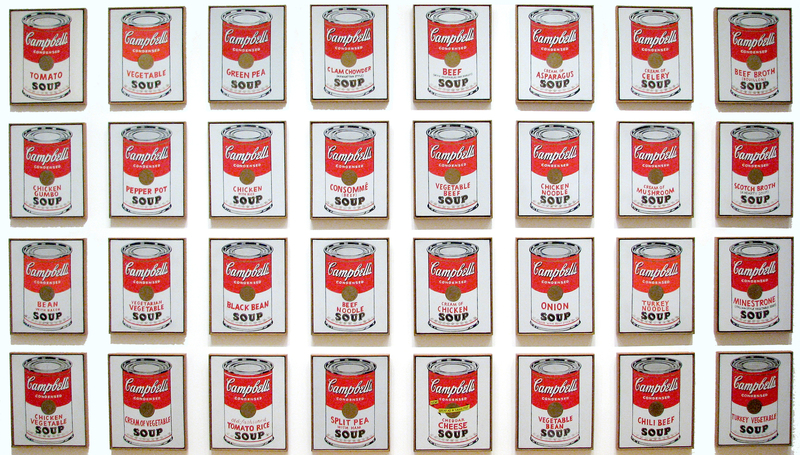 Additionally, Warhol was interested in the banality of photography. His technique was first developed in the 1990’s using photo paper that was at times exposed other’s not with varying colours of light, and is processed leaving behind traces of water and silver nitrate as well as streaks, scratches, dents, and deposits which alter the colour and physical surface of the paper. 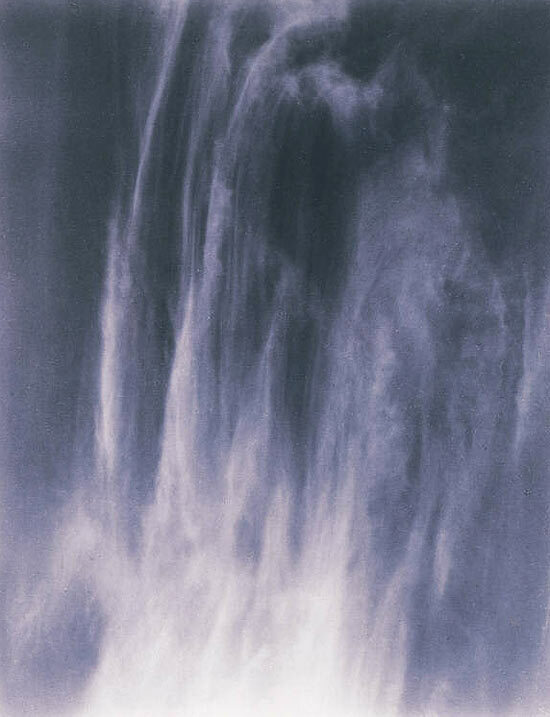 Wolfgang relies on change in the creation of the pictures and are considered in some ways, the opposite of abstract pictures he made in the darkroom. – this has a complete body of works starting as early as 2010 until the present. The response I hope to get from my audience is confusion and questioning as to what the subject matter actually is and a deeper concentration on the image as a whole rather than a certain subject. Ex, door hinges, buttons, plastics, metals, branded materials, ext. By using these up-close images and expanding their size I hope to make the images both engaging and invasive. I want to make images that confront the viewer rather than include them. I would also like to explore both colour and black and white images depending on their content and simplicity. ◦None of those people had ever met Bugs or ridden in a hot air balloon, but seeing images of it made them remember something entirely fabricated. Seeing these fake images goes even beyond altering our memory of events. It can actually change our behaviours towards things. ◦What does it mean to take yourself out of a photo (especially family photo album photos) and what are the effect? How many things from your past do you remember without thinking of a photo? 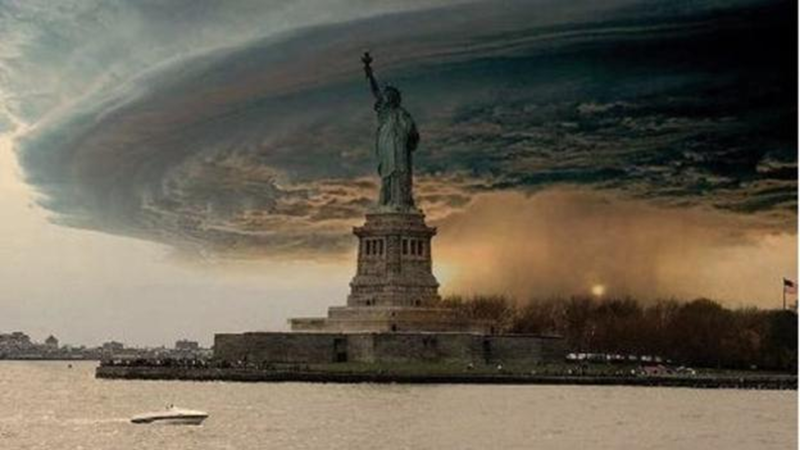 ◦We take pictures to remember events, but also to prove that the event occurred. ◦ when the images of the past are altered our ideas of the past are altered.